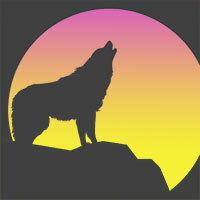 And as the sun rises, the trails come to life again with Howl Rising! It’s the Howl Rising 5K/10K/15K/Half/Full on SATURDAY, JUNE 8TH, 2019. Each race is run on the 5K trail course at Angel Mounds (with the Half doing an additional small loop at the end). The full marathon will start at 6am. All other distances start at 8am. The path will be well marked with signs & arrows. Proceeds to go the Friends Of Angel Mounds. Custom event t-shirts (S-2XL) for all participants. Sign up early to lock in your size! Packet pickup and late registration start at 5:30am at Angel Mounds (8215 Pollack Ave). Click here for more info on Howl At the Moon 5K/50K the night before!